Spoilers for The Flash. Trigger warning for abuse, violence, and imprisonment. Barry no longer has his speed powers, Caitlin's been kidnapped by Zoom, and Zoom is running around faster than ever. 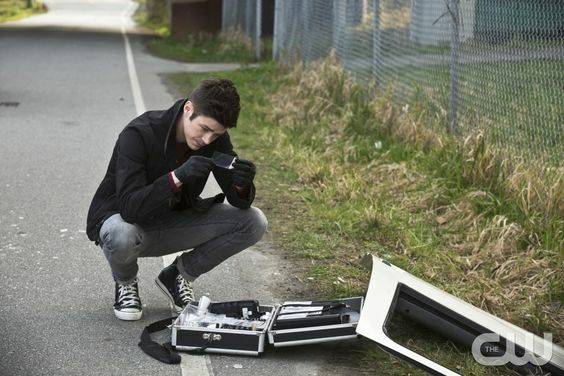 For Team Flash, it is not a good day to be in Central City. When a meta-human kidnaps Harry, the team has to figure out a way to save him... without Barry's speed abilities. Hunter: "You're here because I love you. It may take awhile, but someday you'll start feeling that way about me again too." Wally visits Joe at the precinct. He asks him about the Flash--it wasn't hard to figure out Joe was the connection to the Flash. But Wally doesn't want to know the Flash's identity; he wants to talk to him. However, Joe refuses, saying right now wasn't the best time. Harry shows up at Jesse's apartment. She's still angry at him and refuses to leave with him. She says she's as afraid of Harry as she is of Zoom. (Poor Harry. This is just one sad pity party after another for these guys.) As Harry drives away, a man steps out in the middle of the road. Harry slams on his brakes, but the van hits the guy. Only the guy is a super strong meta, and his body smashes the front end of the van. He comes around to the side and kidnaps Harry! Killer Frost: "Let's make a deal. You get me out of this box, and I'll help you get home. Might even throw in some wardrobe tips for free. So what do you say, Caitlin? Do we have a deal?" Team Flash locates Gray, and Barry says they need to stop him. The boys--Joe, Cisco, and Barry--track Gray to some kind of warehouse (different than where Harry is being held). Gray, of course, isn't willing to hand over Harry. Instead, he starts chucking heavy objects toward them. Joe and Cisco distract Gray while Barry sneaks around to get a better shot. When Barry shoots Gray, he misses. Gray heaves a heavy barrel at Barry, and Barry is injured. But Barry also watches as Gray ages right before his eyes. Jesse finishes tests on the blood, which explains why he ages so quickly. Whenever he uses his abilities, it takes the energy from his body. Iris comforts Barry as he sadly looks at his Flash suit. He tells her that the first person he ever saved after getting his powers was her. She tells him he can still be that person, the person he's always been. Suit or no suit, he can still be a hero. Gray gives Harry ingredients to help him make a cure. They discuss who they care about. (Okay, Gray talks while Harry ignores him.) Gray blames Harry for everything, and Harry just takes it even though he didn't do any of it--it was the other Harrison Wells. On Earth-2, Caitlin tests her device on the glass cage. It works, and she's able to break the glass. Killer Frost steps out. Caitlin wonders out loud how to save the Man in the Iron Mask, but Killer Frost turns on her. (Wow, I never saw that coming or anything.) She shoots ice blasts at her, which causes Caitlin to slip and fall. She says Zoom kept her around because she looks exactly like Caitlin, but now Zoom wouldn't have any reason to keep her. She throws an icicle shard at Caitlin. At STAR Labs, they track down Harry using his watch. Cisco--with Jesse and Felicity's help--revamps Barry's suit. They put a little bit of the material from Ray Palmer's ATOM suit into the front of the Flash suit, which will Barry a little defense (read: exactly one punch from the "He-Man") in a fight against the meta. At the warehouse, Harry finishes his "cure" for Gray. But Gray isn't an idiot; he knows Harry's been stalling for time. Harry admits there isn't a way to cure Gray. Gray gets mad, but before he can pummel Harry, team Flash shows up. The girls cover lookout duty while the boys distract Gray, trying to get him to use his powers. Barry says they can help him, but Gray says it's too late for that. He fights Barry, growing older with every swing. Finally, he punches Barry in the chest. Barry goes flying, and Gray collapses, dead. Barry is a little short on breath, but he's fine. When they go to Gray, he's turned back into his eighteen-year-old self. They rescue Harry and return to STAR Labs. Jesse and Harry talk over everything that happened. Jesse apologizes, but she tries to explain her feelings. Harry understands, and he explains that when Jesse's mom died, he felt so helpless. He hadn't been able to protect her, so he swore he would always protect Jesse. When Zoom kidnapped her, he snapped. He promises to be a better father if she promises never to run away again. Then he calls her Jesse Quick. Wells: "When your mother died, honey...something inside me broke. I couldn't protect her. And I swore--I swore on her grave, no less, that I would protect you and then Zoom took you, and I snapped. I just snapped. I couldn't breathe. I...I couldn't lose the only other person that I love." Joe brings Wally to meet the Flash. When the Flash arrives, Wally thanks him. He promises he won't waste the second chance he's been given. On Earth-2, Zoom re-handcuffs Caitlin to the bed. He tells her she should be grateful he saved her life, but she asks him to take her home. He says she should stay. This gives him another major flashback. (It's almost like he's being... torn apart.) But Caitlin's pleas to return to her earth gives Zoom an idea. (A wonderful, awful idea.) Instead of measuring his success by the number of victims, he's going to measure his success by the number of earths he conquerors. Then, he laughs. He grabs Caitlin and zooms away. Whew, this episode was all kinds of crazy. I expected things to be "back to normal," but now I know that's impossible for someone like Barry--powers or no powers. It was interesting to see how he dealt with the loss of his speed force. Poor Barry. I was excited to see more development with Harry and Jesse. (Especially the whole Jesse Quick thing!) I'm glad they reconciled because it was becoming a bit annoying how bratty Jesse was acting. She definitely has valid reasons for her feelings, but she executed her reaction poorly. The Earth-2 stuff is what I live for. I loved Killer Frost's interactions with Caitlin. I'm kind of sad they killed her off because I enjoyed her character immensely. I'd still like to have some kind of hint at who the Man in the Iron Mask is. I'm still crossing my fingers that it's Hunter/Jay/Zoom from Earth-3 or something. (Maybe the real Jay Garrick?) Zoom, however, is another matter entirely. Maybe I'm still not over Jay Garrick turning evil, but I really feel that the writers are hinting at something more with Hunter Zolomon. He seems to be so conflicted, which stems from his childhood. (*CoughsKyloRenCoughs*) He does seem to care for Caitlin (perhaps his methods of showing that aren't the best), but he's still stuck in the mindset of the monster. Is it too much to hope for a redemption arc? Wally's interaction with the Flash suggests we might be seeing Wally as a speedster soon. I hope so. It will definitely make things more interesting if there's a second good speedster around to help Barry out--or even a third if Jesse turns into one too. The writers have set up a lot of interesting threads for future episodes and seasons. I'm excited to see what's in store next for The Flash! What did you think of "Back to Normal"?